Raith Rovers are aiming to appoint a new manager next week after narrowing their search down to a shortlist of candidates. Club chairman Bill Clark confirmed that “five or six” names are being considered for the post, with caretaker boss Kevin Cuthbert believed to be among the leading contenders. “We’ve had another sift again – and one or two new ones so we had a look at them as well – and narrowed it down to five or six, but we won’t be doing any interviews until next week,” Clark said. “That’s firstly because we want to give Kevin Cuthbert the home game this weekend, and secondly because a number of them are already with clubs and we’d need to approach the clubs for permission to speak to them. Clark added that Cuthbert’s prospects of earning the job are not entirely dependant on the result against Montrose this Saturday. The interim boss has certainly impressed the board with his handling of a difficult situation following the sudden resignation of Barry Smith over a fortnight ago. “He’s certainly enthusiastic, and he’s got the boys well onside,” Clark said. “The spirit in the camp is still very positive. “I watched them training on Tuesday, and the enthusiasm and spirit was there for all to see. “It’s just a pity we lost that goal on Saturday which was a bit frustrating for everybody. While Cuthbert will be given serious consideration, other names linked include Jim Duffy, sacked by Morton in the summer, and Paul Sheerin, the current Aberdeen U20s manager, while Clyde boss Danny Lennon and Alloa gaffer Jim Goodwin ranked highly among fans in a poll run by the Press last week. Former Celtic star Barry Robson, also a coach at Aberdeen, was among the applicants but the Press understands he has not made it onto the final shortlist. Clark added: “We’re determined to get the right person so that’s why we’re taking our time. “Next week will be soon enough, and if we get the right person, then we’re hoping the fans will be happy. “We’ve got a choice so we just need to talk to these people and see what they can bring to the club. 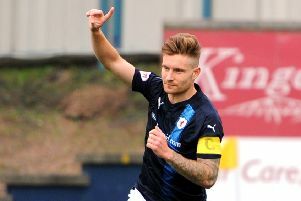 With Raith’s small squad continually stretched by injuries, any new manager is likely to be given the chance to bring in at least one loan player, with clubs in the lower league having until the end of September to complete their transfer business. “That’s why we’re keen to get all business done next week,” Clark explained.